I’m often asked which social networking site a novice should choose to get started on so today I’m going to address that question. The short answer is that you should be where your target market is! Whilst I’m going to discuss some general information I believe we all need to research our own audience. Ask your customers, prospects, competitors and network which platforms they use, what they use them for and how often they visit. This will give you an idea where to start, what to contribute and when to post and as I said in my last post your first social media contacts will be from your existing network. Don’t forget the question about what people use their social networks for because you might well find your audience is on Facebook but in a purely social context, they may not want to share what they get up to at the weekend with you! Who is on what social media platform? As I said earlier these statistics are both general and fluid so are a starting point rather than a definitive answer! Facebook has around 1.5 billion users 23% of whom log in at least 5 times a day. 40% of its users are 45-54 with slightly more being men than women. 70% of marketers have acquired new customers via Facebook. Facebook has so much insight into its users that it is possible to target advertising via the platform very precisely. Twitter has 550 million registered users of whom 215 million are active on a monthly basis. It has grown by 44% in the last three years and is used for lead generation by 34% of marketers. 65% of Twitter users are female and they are evenly split between the 25-34, 35-44 and 45-54 age groups. Google+ there are over 1 billion enabled accounts and 359 million active users monthly. The platform has grown by 33% in one year and has increased its use amongst 45-54 year olds by 56% since 2012. Being active on Google+ should help with search engine optimisation. 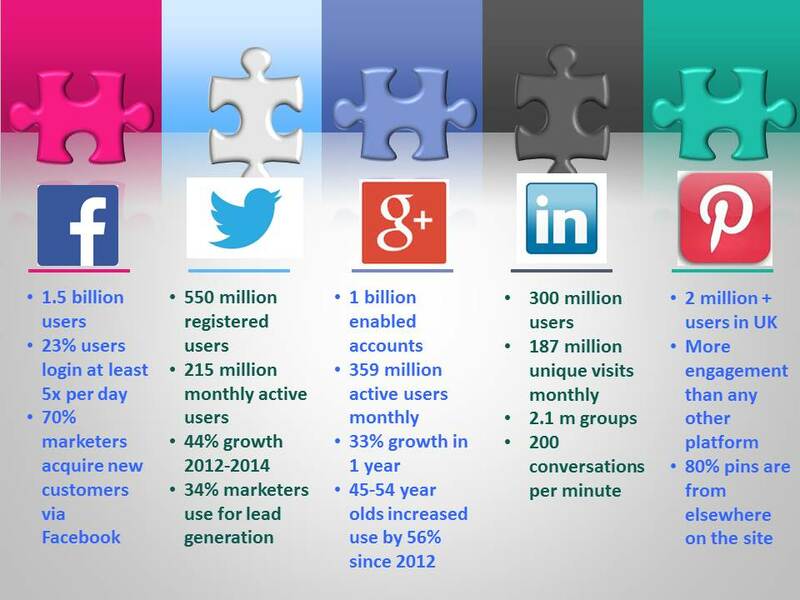 LinkedIn has over 300 million users and 187 million unique visits monthly. Special interest groups are a big feature of the platform with over 2.1 million groups and 200 conversations every minute, you are bound to find groups in your area of interest. Linked In is primarily used by professionals in the 35-54 age group. Instagram, now owned by Facebook has more than 200 million users and has grown by around 100% in a year. Users tend to be younger than some of the other platforms with teens to mid 30s dominating. In my next few posts I’ll share some insights into how businesses are using the different platforms. I hope you’ll check back in here on Monday. This entry was posted in Marketing, Networking, Small business advice and tagged Facebook, Google, Instagram, LinkedIn, Pinterest, Social media marketing, social networking, Twitter by glendashawley. Bookmark the permalink.